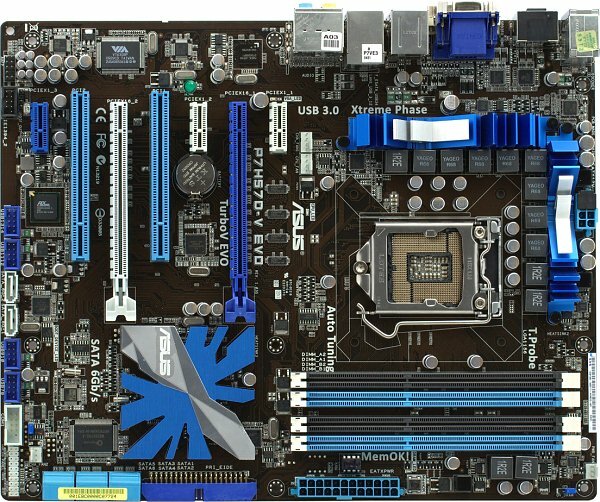 Having decided to make a motherboard based on the Intel H57 chipset, a manufacturer should clearly understand how this decision can be justified. Because H57 differs from H55 only by having slightly more peripheral functionality, namely more PCIe lanes and USB ports and SATA RAID support. Obviously, this isn't critical for most areas of use. But the selling price of H57 is higher nevertheless. 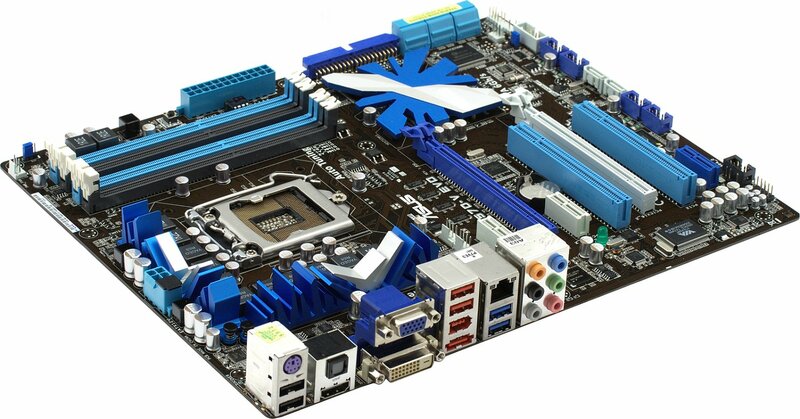 So in this case ASUS decided to use the H57 chipset as a foundation for a top-class Socket 1156 motherboard. This went beyond additional peripheral controllers (which naturally include USB 3.0 and SATA 6Gbps). ASUS did a truly good job, having released an integrated motherboard combining support for both SLI and CrossFire. As you may remember, the discrete Intel P55 chipset, the first announced for the Socket 1156 platform, supported SLI and CrossFire by means of CPU's PCI Express controller. But when the integrated H55 and H57 were released, together with Clarkdale processors, it was said that the novelties offered integrated graphics cores of the aforementioned Clarkdale CPUs at the expense of support for two and more discrete graphics cards. However, ASUS engineers found a kind of loophole in these seemingly unambiguous specifications. The H5x chipset series actually didn't allow splitting CPU's graphics interface (PCI Express 2.0 x16) into x8+x8, but only if Clarkdale CPU were involved. But take a good old Lynnfield without integrated graphics and you're good to go with decent SLI and CrossFire, despite the chipset. It's hard to say whether a product combining the advantages of both P55 and H57 can be in demand. What we have today is a rather expensive motherboard that isn't going to be mainstream. And it's not clear who might need both integrated graphics and SLI in a top-class motherboard. Well, at least now ASUS has an H57-based model with SLI support -- something its rivals cannot boast of. But let's see whether you have reasons, other than pride, to buy this innovative product. Note that all ASUS Socket 1156 motherboards belong to the same P7P55/P7H55/P7H57 series, look very much alike and have similar proprietary functionality and software. Don't be surprised, if you notice many familiar features. The PCB layout is well thought-out, so the advanced functionality hardly affects the convenience of assembly. There are 2 PCIe x16 slots that can work simultaneously as x8+x8, if you have a Lynnfield CPU. The slots are conveniently situated, not preventing you from connecting cables and installing memory modules. Then there are 2 PCI slots, one of which may be obstructed by the second graphics card's cooler. It's interesting that there are 2 regular PCIe x1 (PCIe 1.0) slots, while the third slot of the same form-factor (the blue one) actually works as PCI Express 2.0. We'll describe how ASUS managed to achieve this further. Numerous peripheral connectors are situated along the edges. This may be somewhat inconvenient, if you have a compact enclosure. But IDE and SATA connectors are horizontal, so they don't interfere with the installation of long expansion cards. The list of supported legacy interfaces includes the aforementioned IDE and COM. The latter is living the second youth or something. Everyone tends to add it to their products, whether it's top-class or mainstream. There's no FDD support, though. The DIMM sockets are of ASUS's proprietary design and only have latches on one side. This is called to speed up the installation and removal of memory modules and add comfort to messing with the nearest expansion card. The CPU VRM has 8 phases for the CPU core, 2 phases for the uncore logic (included the memory controller) and 1 phase for the integrated graphics. Each phase features 3 MOSFETs, and the memory modules power converter has 2 phases. The design isn't a top-class one (high-end motherboards have ridiculous circuitry with twenty, forty phases), but it's decent and even excessive. 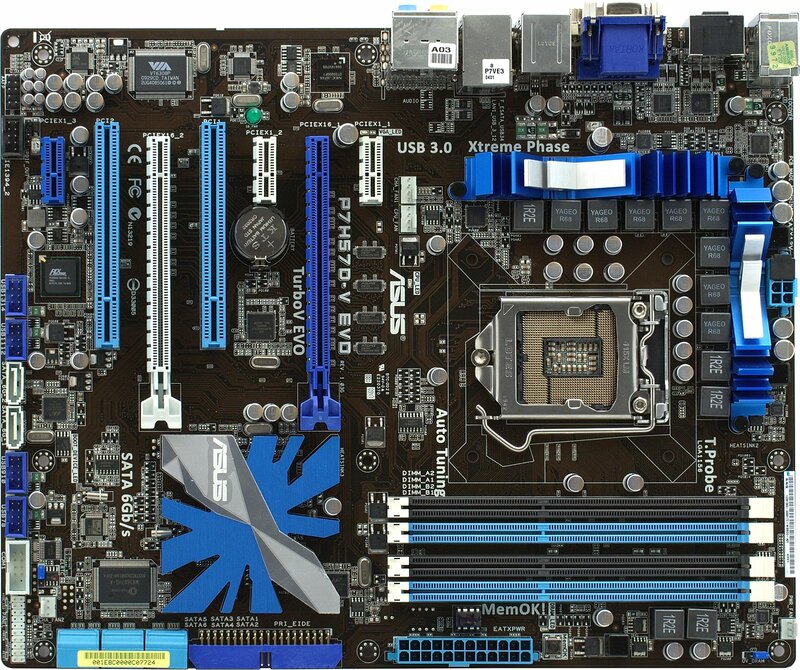 Besides, the P7x55D series motherboards have the T.Probe feature managed by a standalone controller. The feature balances out the load (and temperature) on different PWM converter phases. We can't say much about it until ASUS discloses more details. Besides, the proprietary utility that should at least explain something is kind of strange (see ASUS P7P55D Deluxe, P7P55D EVO review). Of course, ASUS P7H57D-V EVO can boast of traditionally polymer capacitors made by Nichicon (former Fujitsu), Low RDS(ON) MOSFETs, and chokes with ferrite cores. The cooling system should already be familiar. It's the same flat snowflake on the chipset and a couple of "winter-style" heatsinks. Since ASUS P7H57D-V EVO isn't the highest-end in the series, the heatsinks on CPU VRM MOSFETs don't have a heatpipe. The design is completely justified, because the compact cooler doesn't interfere with the installation of large expansion cards and CPU coolers, but it does its job efficiently nevertheless, so the heatsinks remain warm at best. It's a pity that the MOSFET heatsinks aren't fixed by screws. Not vital, but they could've shown a bit of generosity. Traditionally for the ASUS P7x55D series, the PWM controller disables inactive phases, when the CPU is idle. The proprietary utility EPU-6 Engine visualizes the process and lets you save parameters (e.g., CPU voltage) for several reduced power consumption and overclocking modes to quickly switch between those. Other peculiarities include 4 onboard LEDs which light up in case of problems with CPU, RAM, graphics card and bootloader. This might help, if you don't have enough PC building experience and need to know why the machine doesn't boot up. ASUS P7H57D-V EVO also supports MemOK!, a proprietary feature that helps install memory modules not fully compatible with the current BIOS settings. When you press the matching button, the motherboard automatically tries to adjust memory frequency and timings (first of all, setting those to a compatible mode according to SPD). It may even increase voltage, if needed. As a result, the machine will almost surely boot up with new modules, and you won't even have to reset CMOS. 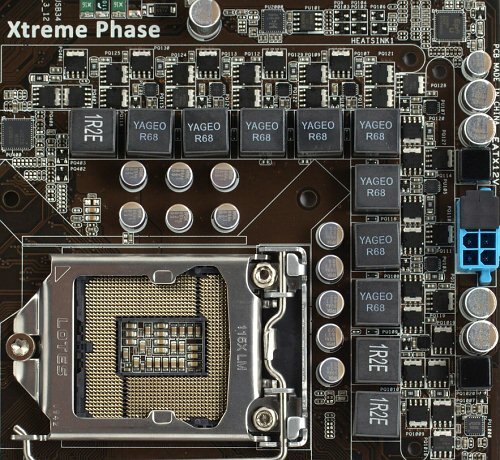 Compared with regular motherboards, BIOS monitoring features are significantly expanded in the voltages department. Aside from CPU core and three standard ATX voltages, it shows that of the integrated memory controller, graphics core built into CPU, CPU PLL, as well as memory and chipset voltages. 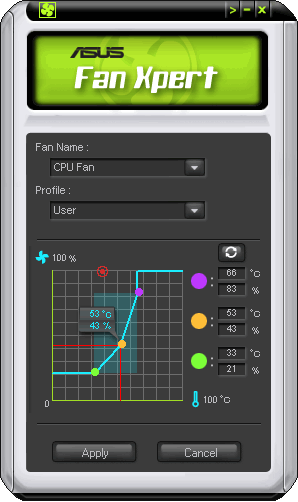 The BIOS can automatically control CPU and 2 system coolers and the features are quite flexible. But the most flexibility is provided by the Fan Xpert utility for Windows, so there are no reasons why you shouldn't use it.